They may not be the most likely theatre performers – but two of the country’s most talked about politicians have proven a hot ticket at this year’s Fringe. Jeremy Corbyn is set to join former First Minister Alex Salmond in fronting his own festival performance. The Labour leader will join Fringe mainstay Susan Morrison at the New Town Theatre on August 27 for a one-off show. In conversation with Jeremy Corbyn will chart his “eventful” rise “from backbench MP to PM-in-waiting”. However, tickets for both events have proved popular, with Mr Corbyn’s performance selling out in a matter of hours and weekend tickets for Mr Salmond’s events also fully snapped up. A spokesman for the Labour leader said: “The journey from backbench MP to ‘PM-in-waiting’ has been long and eventful. “Jeremy will speak to comedian and broadcaster Susan Morrison about what makes him tick, how he deals with adversity, and why our country, and its politics, needs to be transformed. It comes just a week after it was announced ex-SNP chief Salmond would perform his own show during a two-week stint at the festival next month. Titled Alex Salmond Unleashed, the event will take the form of a chat show, with promotional material promising a different guest from the worlds of politics, sport and showbiz every night. Mr Salmond, who lost his Westminster seat in June’s general election, pledged to dish the dirt on political rivals during the one-hour show, set to run every day at 1.45pm from August 13-27 at the Assembly Rooms. Promoters have promised “a bit of light-hearted banter and a few behind-the-scenes revelations about his time in power”. Speaking to a Scottish newspaper, Mr Salmond said: “I have always fancied a spot at the Edinburgh Fringe and this is going to be lots of fun. Obviously in the show there will be lots about politics but the emphasis will be very much on the lighter side. “Among the invited guests there is already plenty of excitement and quite a few surprises. I suspect some people might be taken aback at the range of friends whom I invite along. Former politicians to appear at the festival include George Galloway, Gyles Brandreth and Lembit Öpik, however this year the programme features several well-known names from the political world. 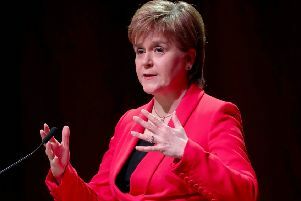 First Minister Nicola Sturgeon will be appearing at a number of events during the International Book Festival and culture secretary Fiona Hyslop is hosting a “chat-show” at the International Conference Centre during the festival season.